Sony held an event yesterday to announce the PS Vita launch date for PAL territories of February 22, 2012 and the titles available for launch. Along with the launch titles, Sony also mentioned a long list of titles that are in development, which included none other than WB Games with a game titled simply "Mortal Kombat". 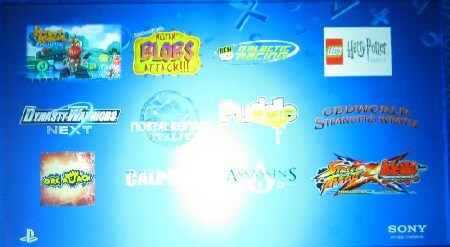 However, in a presentation slide to illustrate the numerous number of games in development, the previously rumored "Vitality" title was one again front and center, this time in a more stylized and final logo. While the game has not been officially announced by WB Games, we can all but guarantee that the game will be titled Mortal Kombat Vitality. Granted, what kind of game Vitality will be is still unknown, but it is good to see that Warner Bros. is pushing the franchise to the front lines of their console launch efforts. Quite difficult to see with the glare, by it seems the logo is made of ice. Sub-Zero Mythologies 2 anyone? Not exactly a surprise, seeing as it was leaked/shown a while back. Hopefully there's something else new that will knock my socks off. Time to start saving for the PSVita. I'm starting to wonder whether there is any advantage to a game as a launch title. More sales due to the small selection of titles? Maybe that will depend on whether MKV will just be a portable MK9. All we know is that it's directly competing against SFxT, so NRS really needs to make it an entirely new game. Time to start saving for the PSVita. ok um.... ice blue logo the word "vitality" (remember urns of vitality from mkmsz?) it also uses the same font from mkmsz. maybe its a subzero game for vita. doubt it, but would be cool. no pun intended lol. I am really pissed of at this news, every PC gamer has been begging for a PC version and finally he releases a PSP version. No psp fans even asked for it. I asked for it! I wanted to be able to play MK9 while I was away from home. We don't know if it's a handheld version of MK9 or a brand new game. http://www.ps3site.pl/mortal-kombat-na-ps-vita-to-port-wersji-z-ps3/92350 As far as I understood Google's translation, they claim MK:Vitality to be a port of PS3's game. Vita + Fatality = Vitality? Other Ocean actually did a very fine job porting UMK 3 to DS, so they are not all that bad. New features huh..I hope for new characters and arenas but I don't think we'll be getting those... Instead we should get the new brutality system they had created but due to lack of time it was cut.